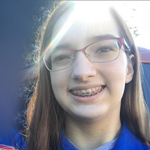 Meet AstroBot Kaitlyn, an active FIRST student on two teams FTC Team 8798 Aluminati Industries and FRC Team 86 Team Resistance. 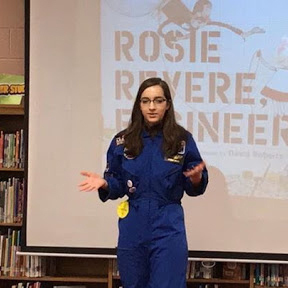 She also serves as a STEM advocate & speaker, Girl Scout, and mentors 4 FIRST LEGO League teams. Hello! My name is Kaitlyn (a.k.a AstroBot Kaitlyn). 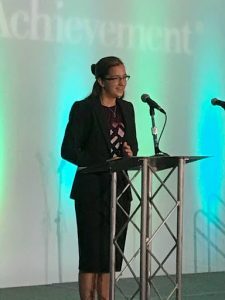 I am a STEM advocate and speaker who is on two FIRST teams and mentors four FIRST teams. 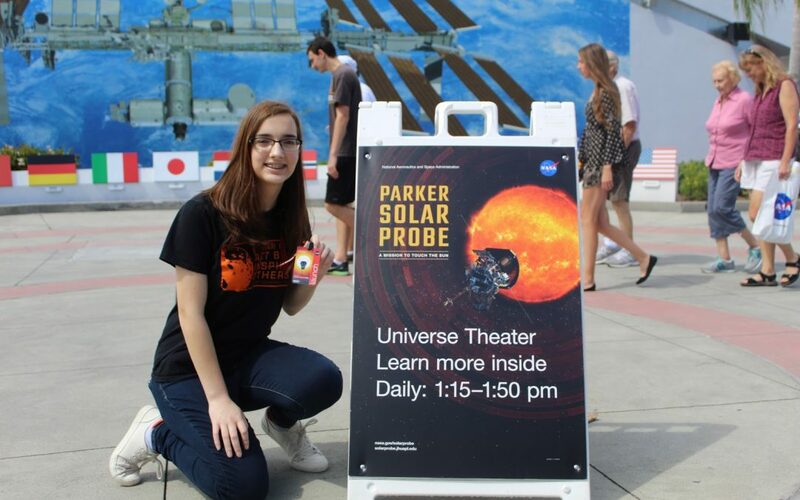 I started advocating for STEM and Girls in STEM in July of 2017 after I won a scholarship for, and attended, Space Camp USA in Huntsville, Alabama. I’ve been involved in FIRST for about eight years now; I am a hardware specialist, the videographer, and the design lead on FTC Team 8798 Aluminati Industries, and I am an outreach coordinator and programmer on FRC Team 86 Team Resistance. I also mentor four FLL Teams: The Orange Eaters (Girl Scout Team), The Lunatics (Girl Scout Team), The StarDust Collectors (Girl Scout Team), and “Bee” Fit in Space (Elementary School Team from Charles E Bennett – a low income school). My parents have always allowed me to explore STEM; some examples include building and launching model rockets and catapulting my Halloween jack-o-lantern off of the top of a tree. But I always had a love for LEGOs growing up. One amazing STEM advocate in my area, Kathy Schofield, brought FIRST Lego League to Clay County Schools; I thought that since LEGOs were so cool, programming them to move must be cool too. I decided to join, and I was hooked since the first meeting. This is where the perseverance comes in; I continued to come to meetings, and I continued to program and design. The idea was to ignore the doubt and bitterness. Now, this is where mentors came in; I had a hard time working with my teammates and having confidence in that atmosphere. But, an amazing mentor, Taylor Richardson (a.k.a. Astronaut StarBright) awarded me the scholarship to Space Camp and guided me on advocacy. Now I advocate online, public speak, mentor others, and had confidence in my STEM abilities. There are so many STEM opportunities available for you; I would definitely recommend FIRST teams, SWE (Society of Women Engineers), and NCWIT (National Center for Women in Information Technology). They have countless opportunities for girls to get a jump start on STEM. But don’t let opposition stop you; being involved in STEM is for your benefit. Also, find a great mentor that will help you along the way. Then when the time comes, you can be an awesome mentor for a young STEM girl. FIRST is important for females because it is a completely inclusive opportunity for everyone to gain experience in STEM in a way that is set up for each member to succeed. 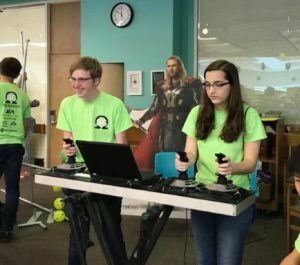 FIRST is not only building robots, it’s problem solving, designing, media, and much more; it is designed for all types of people to get involved and gain a full STEM education that you cannot find anywhere else. My position allows me to work with other advocates to reach an audience. Our goal is to excite others about, encourage them to become involved in, STEM. One opportunity that allowed me to make a difference was my scholarship to robotics camp at Shiva Robotics Academy, in which I awarded a young girl a full scholarship to a week of robotics camp. My position on the Girl Scouts of Gateway Council Board of Directors has also allowed me to excite the local girl scout council about robotics and forming FIRST robotics teams. STEM is growing, and it is time that more people are involved! FIRST has helped me accomplished many goals I have aspired for since I was in Elementary school. Growing up, I had always wanted to program in different languages and lead a group of others. Being on FIRST teams has given me experience that has allowed me to fulfill these goals.